Not sure if these a the correct order, but you get the point! High school was weird for me. Hope you are feeling better about yourself. What’d I learn from all this? That I’m a screw up, mainly, and to be VERY careful with my words. God help me, I hope my list after I finish college won’t be so bad. I hope to be a respectable, righteous person at some point in my life. Call me a crazy, superstitious, extremist Christian whacko of the same variety as those who would have cried, “Burn the witches!” if you must, but this scared me a little when I saw it. Since then my stats have changed, but I can’t help but wonder if this means something. 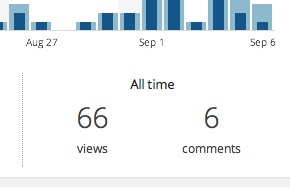 Tell me the truth, is this blog Satanic? As much as I like to think that I trust God and take things a day at a time, the truth is that I love planning more than is good for me. I’ve got to know that I’m doing tomorrow, what I’m eating for breakfast, what I’m going to wear, down to the tee. But forget tomorrow, I like planning much beyond that! Now is one of those rare times in my life when I not only don’t know definitively where I’ll be in a few weeks, but haven’t decided yet either, and it terrifies me. It’s kind of like when you’re in a car with a bunch of indecisive family members. Should we go to Subway? In and Out? Where do you want to go? And the driver doesn’t know where to turn. And then there’s me in the passenger seat, hoping we don’t crash. Of course, the family will eat, and I will be okay, God willing. In reality, I’m being petty. This will sort itself out. While now I worry about how I will get to school, if I will have any friends, what I will be able to do, I know that it’s stupid to worry about such things. But why won’t anyone listen to me, I wonder now, or at least give me a color coded schedule so I’ll know what to expect. But I need to research this, and consider this, and agonize over this, and stress about that.